The tricky thing is, sometimes these spur of the moment hankerings my husband gets occasionally lead to life-changing talents, like the time he decided to learn Chinese, or the time he talked me into enrolling with him in Karate for the summer. And then sometimes they turn out to just cost us money and give us little in return, like the 5 times he’s got his heart set on starting a business. So on one hand I do my best to temper his impulses if I feel they are too outrageous or expensive. On the other hand I hate to kill his enthusiasm. It’s one of my favorite traits. As you can see, they needed some help. They had some broken pieces, at least one was a little unsteady on its feet, and the colors could slap you in the face from a mile away. Plus, several had been upholstered in picnic tablecloth fabric. Yuck. They didn’t get finished right away. They did get sanded right away, though, and took up residence in our kitchen. 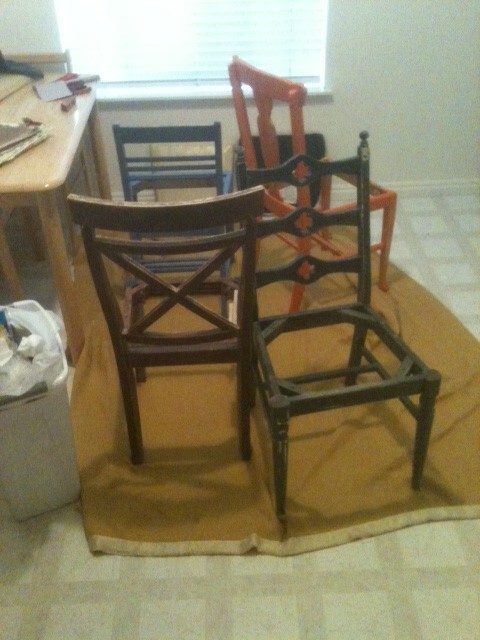 The dismantled and sanded chairs, residing in our garage/kitchen. The final product, at last! And you can rest assured that this will be a hobby we plan to continue. 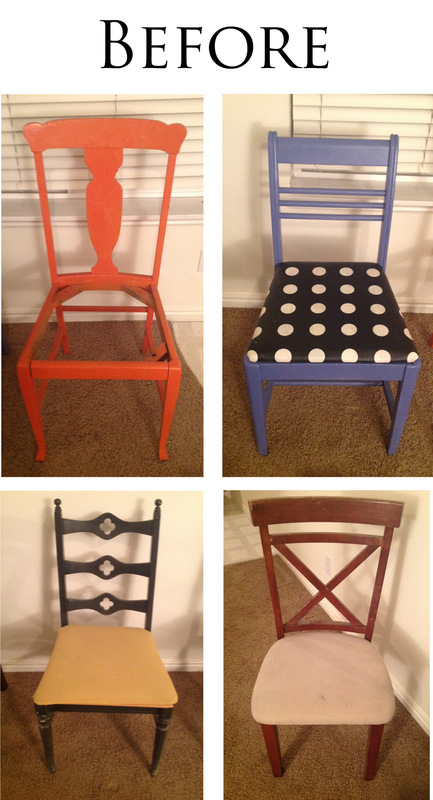 Three bar stools have already taken their place in our workshop/kitchen, just begging to be made pretty again. Look out for our next project!